what jay has to say ...: halloween planning? Baby Girl isn't due until October 25th and I know she will come in her own time, but it's a fact that most first babies are late. That being said, Halloween is mine and my husband's favourite holiday so no matter when she comes, she will be surrounded by all sorts of spooky goodness. I will wait until a bit closer to my due date but how cute is this Halloween costume? I am dying of cuteness overload. My husband says to just buy it but I am going to wait. Even though it's really hard to. My niece and nephew are going to be Tinkerbell and Peter Pan for Halloween this year. I can't believe that we are already into September and parents have to buy costumes now or they will miss out. 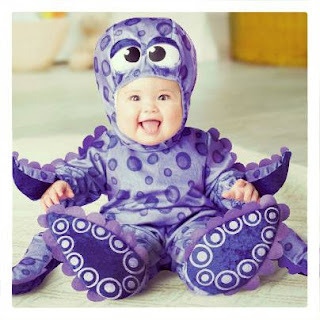 Do you know what your child is going to be for Halloween this year? Would love to see the photos friends!